Since his late rally was cut criminally short by an early tolling of the bell against Timothy Bradley, the career of Jessie Vargas has been an up-and-down affair. He was WBA Super Lightweight champion, undefeated and looking to make a name for himself in the Welterweight division. The tall Las Vegas native was well behind on the cards, but had Bradley (L UD 12) in all sorts of trouble, but the bell rang several seconds early, denying Vargas from what he insisted was bound to be a dramatic late knockout win. He then snatched the unbeaten record of Sadam Ali (W TKO 9) to become a two-weight world champion, but instantly lost that crown when widely outpointed by legendary Manny Pacquiao (L UD 12). 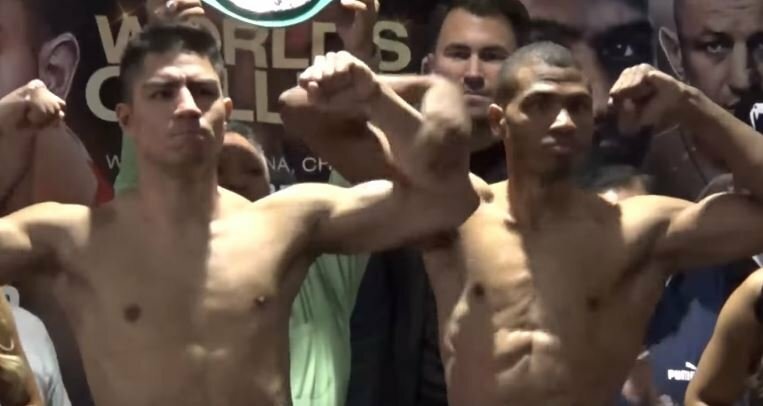 Tough Aaron Herrera (W UD 10) saw Vargas back to winning ways a year later, before a contentious draw with the outspoken Adrien Broner (D MD 12). Now with the aid of Matchroom Boxing guiding his career on the DAZN (Da-Zone) platform, he looks to close in on another world title shot when challenging for the vacant WBC ‘Silver’ Welterweight title. There is no denying that anything less than a win against Thomas Dulorme would be a disaster for Vargas 28-2-1(10KO’s). But the French Guiana born Puerto Rican is a worthwhile test for most fighters on the fringes of world championships. In 2012 Dulorme’s early promise was hacked down by the fists of Luis Carlos Abregu (L TKO 7), and following a rebuild that included wins over Karim Mayfield (W UD 10) and Hank Lundy (W SD 10), he was fed to the fast rising superstar Terence Crawford (L TKO 6) in Dulorme’s only world title bout to date. It has now been 14 months since his last bout, a defeat to improving Cuban Yordenis Ugas (L UD 10). Dulorme 24-3(16KO’s) looked on route for a third stoppage loss after a pair of knockdowns in round 2, but it was his performance in the second half of that contest that bolstered his reputation and kept his career alive. He floored Ugas in the 7th, and in spite of two point deductions he only lost by the narrowest of margins. It seems that Dulorme’s chin is susceptible here, and although not a devastating puncher, Vargas hits hard enough to end this bout inside 12 rounds. But given a sniff, Dulorme can make this a very uncomfortable night for Vargas, and while the fans will benefit, Vargas cannot afford to be in a nip-and-tuck battle with so much at stake. The gut feeling is that a meeting with Amir Khan awaits the winner, and with the thought of more big fights ahead, Vargas will be spurred on to put on a show. Vargas can drop Dulorme early, and control much of the action from then on. The Puerto Rican is game enough to catch Vargas clean on several occasions, but as the fight heads beyond the 8th, Dulorme will tire and Vargas will pounce, finishing the bout in round 11.